In September 2011 mobiles and tablets accounted for just 1.51% of all visits to the DH website. In September 2012 this has increased to 7.9% - that's 11,820 visits last week via a mobile device compared to 927 a week just over a year ago. The increase has been fairly steady over the past year, with a significant jump in the week after Christmas. I guess a lots of iPads were received as presents! 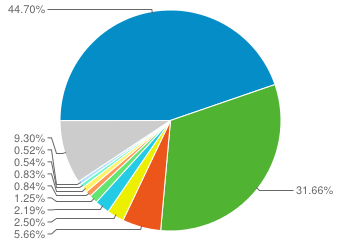 Looking at which devices are being used we can see that together, the Apple iPad and iPhone account for more than 75% of visits (iPad 44.70, iPhone 31.66%, Unknown 5.66%, SonyEricsson 2.5%, Samsung 2.19%). The information strategy for health and care discusses the use of mobile devices in more depth. This is an extract from the strategy: "Over the ‘digital decade’ of the past ten years, we have seen an explosion in our take-up and use of mobile phones and other mobile devices (hand-helds, tablets and so on). There are now more active mobile phone subscriptions (80m) than people in the country, with over 90% of us having at least one mobile phone. "Although many of us still use simple mobile phones for voice and text, increasingly our devices are smartphones that can search the internet and access a range of web-based services. Over a quarter of UK adults now have a smartphone, and 23% of our online surfing is now via a mobile device."